Publisher: George Allen & Unwin, London, 1932. First English edition. Condition: Hardcover, with dust jacket. Very good. Slight wear and sunning to dust jacket and book. 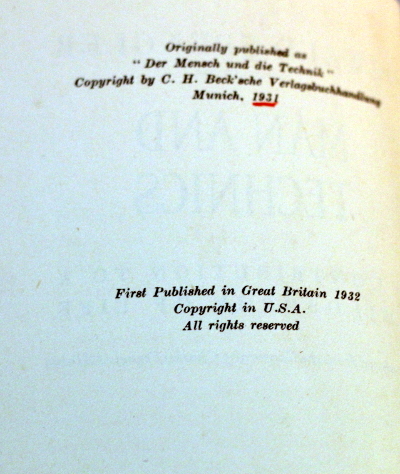 Tanning to endpapers, inscription to ffep, and slight foxing. Sparse underlining in red, to the last few pages of book. 104pp. App.8.5″ by 5.5″. A scarce book. 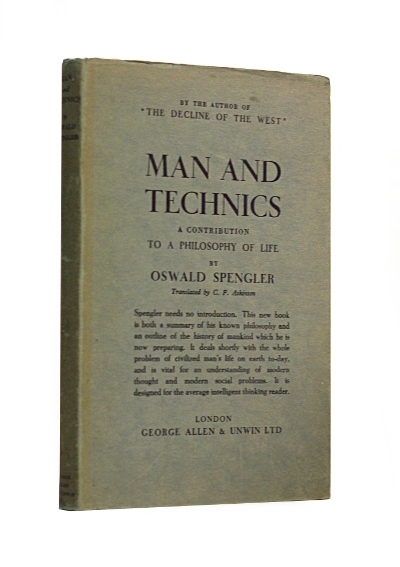 Man and Technology: A Contribution to a Philosophy of Life is a short book by Oswald Spengler discussing a critique of technology and industrialism. 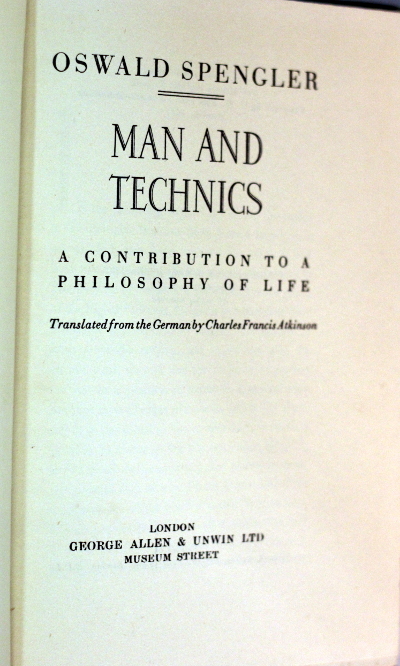 It was published as Der Mensch und die Technik in Munich in 1931. The principal idea in this work is that many of the Western world’s great achievements may soon become spectacles for our descendants to marvel at, as we do with the pyramids of Egypt or the baths of Rome. He especially pointed to the tendency of Western technology to spread to hostile “Colored races” which would then use the weapons against the West. In Spengler’s mind, our culture will be destroyed from within by materialism, and destroyed by others through economic competition and warfare. Oswald Arnold Gottfried Spengler (29 May 1880 – 8 May 1936) was a German historian and philosopher of history whose interests included mathematics, science, and art. He is best known for his book The Decline of the West (Der Untergang des Abendlandes), published in 1918 and 1922, covering all of world history. Spengler’s civilization model postulates that any civilization is a superorganism with a limited and predictable lifespan. He wrote extensively throughout World War I and the interwar period, and supported German hegemony in Europe. His other writings made little impact outside Germany. In 1920 Spengler produced Prussiandom and Socialism (Preußentum und Sozialismus), which argued for an organic, nationalist brand of non-Marxist socialism and authoritarianism. Some Nazis, including Joseph Goebbels, saw Spengler as an intellectual precursor, but he was ultimately ostracized by the Nazis in 1933 for his pessimism about the future of Germany and Europe, his refusal to support the Nazi ideas of racial superiority, and his critical work The Hour of Decision.